Help us collect and celebrate stories of the powerful contributions made by African women who lead every day, in every way. We Will Lead Africa is curating a volume of stories of the countless African women that are transforming Africa in leaps and bounds, despite challenge and hardship. Without the inclusion and voice of women, Africa will never reach its full potential. Documenting their stories in all their breadth and beauty, will bring new perspectives and possibilities and will provide a space of inspiration and togetherness for a future that values, respects and learns from African women. Lead: Everyday leaders, motivated by service, in every sector, including emerging leaders from marginalised groups. Women with a deep authenticity and integrity in their leadership, focused on a values-driven path, even if it is challenging. This volume will exemplify the We Will Lead Africa ethos and express the variety, creativity and magic that the inclusion of women brings. We are looking for a diversity of experiences – from different sectors, areas of focus, geographies – told in different mediums. So we need you – everyday African woman leader – who is already in action, to share your story with us and the world. Join #WeWillLeadAfrica. Tell your story of action, change and transformation. We believe in the power of storytelling, an inherent part of African culture, as a powerful tool for imagining, sparking and driving progress. And as a way to inspire more change and shape the futures we want. This book will speak to action and practice. 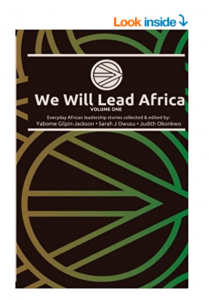 It gathers the stories of those who have a deep interest in or connection to Africa, and have been stirred to action that is making a difference; stories about leadership, by women, in and for Africa. All stories should meet the submission criteria and use this Submission Form as the cover sheet for their story. Submission schedule and timeframes will depend on number of stories submitted, but we expect to publish the volume in mid-2019. Sarah is an Organisation Development specialist focused on culture, employee engagement and change navigation, passionate about dialogue and fostering conversations. A planetary citizen she is Danish / Ghanaian, born in Botswana and is currently based in Maputo, Mozambique. She has worked with Africa 2.0 (and is their Champion for Capacity Building), Peace One Day and British Airways leading transformational change programs and in 2014 she won the Women4Africa award for Inspirational Woman of the Year. Her current work spans a variety of organisations including implementing transformational change strategies and supporting the entrepreneurship ecosystem in Mozambique. She has a Masters in Philosophy, is an Integral Coach and a Reiki practitioner. Moyra Keane is an Educational Developer in the Centre for Learning Teaching and Development at the University of the Witwatersrand, Johannesburg. She coordinates and teaches on postgraduate courses, presents workshops and courses for academic staff. These include Research Writing; Qualitative Research Methodology; Writing Retreats; Postgraduate Supervision, and Teaching in Higher Education. She coordinates a mentoring programme for staff, and supervises post-graduate students. She is a qualified coach and coaches PhD candidates. Her undergraduate disciplines include psychology, physics, chemistry, English and education. Her current research interests are in participative research, indigenous knowledge, supervision, and the Scholarship of Teaching and Learning. She is past president of the International Organisation of Science and Technology Education, and President Elect of the African Association of Indigenous Knowledge Systems. She has published 20 journal articles; 17 books/ book chapters and reports; and given 50 conference presentations. Her other interests include creative writing, Tai Chi and meditation. Chenge Maruziva is a change consultant with a deep interest in people empowerment, capacity building, social transformation and education on the African continent. She is a co -founder of Watu Africa, lover of intersectional conversation and thought leadership, seeking to shape narratives for equality and justice, to make the world better at all levels of society for all people.